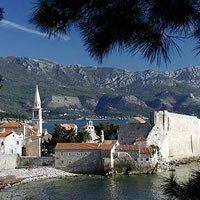 The European Individual Chess Championship for men will take place in Budva, 4-19 March 2009. It will be an 11 rounds swiss tournament with 245 titled players of which 143 GMs and 78 IMs. The total number of participants is 316, which makes it the third biggest event, after Dresden (403), and Plovdiv (326). Top seeded at the 2009 EICC will be Topalov’s second GM Francisco Vallejo Pons, who is here with GM Ivan Cheparinov and Erwin L’Ami. Ine of Kamsky’s seconds, GM Volokitin will be in Budva as well. The other 2700 club participant, besides Vallejo, will be GM Akopian, however, GM Naiditsch, GM Malakhov, GM Vitiugov, GM Bologan, and GM Nisipeanu will be striving to pass the mark at this championship. The top junior of the EICC competition is GM Fabiano Caruana, followed by GM Nepomniachtchi, and GM Ivan Saric. Surprisingly, several countries will not be represented at the championship, including Norway, Albania, Belgium, Estonia, Iceland, Lithuania, Latvia, Malta, and Monaco. There will be very few women players, as this years Women Individual Chess Championship takes place in Sankt Petersburg.